In the first quarter of 2014—the year Colorado made it legal to sell recreational marijuana—cannabis-infused candies, pasta sauce, beef jerky and other foods made up 30 percent of legal sales. By the third quarter of 2016, that figure had grown to 45 percent. And the popularity of these so-called edibles will soar higher still: In the 2016 election, California, Maine, Massachusetts and Nevada all voted to join the Rocky Mountain State, Alaska, Washington, Oregon and Washington, D.C., in legalizing recreational weed. These new markets should trouble parents, policy workers and professionals who work to prevent adolescent substance misuse, said Margie Skeer, associate professor of public health and community medicine at Tufts. “We’re masking a drug and making it seem less risky,” she said, adding that the younger people are when they start using drugs such as pot, the greater their risk of developing neurocognitive, mental health and substance-related problems. 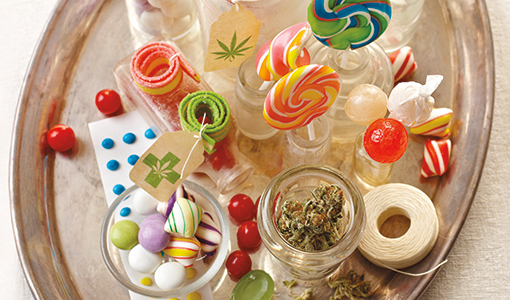 Ahead, Skeer outlines what you need to know about edibles—especially where kids are concerned. A recent study examined unintentional exposure to marijuana among children who were treated at a children’s hospital and regional poison center in Colorado between 2009 and 2015, the year after it became legal to sell recreational marijuana in the state. Findings indicated a five-fold increase in the number of children under 10 exposed to marijuana, from nine cases in 2009 to 47 cases in 2015. Marijuana edibles—including baked goods and candy—were implicated in more than half of the exposures. In 2015, only 12.3 percent of high school seniors believed that trying marijuana once or twice was harmful (down from 18.5 percent in 2009). The perceived risk of smoking marijuana regularly also dropped, to fewer than one in three believing it was harmful. Skeer thinks that edibles—which may appear less risky than smokable forms—will push these numbers even lower. “Smoking gives you a mental cue that you’re taking a drug,” she said. “Edibles remove part of that cue.” The THC-dosed snacks also make it significantly easier for adolescents to use pot covertly (and without the telltale odor), which could drive up use. When marijuana is smoked, THC is quickly absorbed into the bloodstream and then travels to the brain in a matter of minutes, even seconds. But ingestion is a much slower process: An edible must be digested before the THC can enter the bloodstream through the stomach lining and small intestine. It can take about 30 to 60 minutes to feel the drug’s effects. Someone who is not aware of this delay might eat more, not recognizing the potential harms associated with the increased dose.